Chinese President Xi Jinping arrived in Panama City on December 2 for a state visit to Panama, the first of its kind since China and the Central American country established diplomatic relations in June 2017. 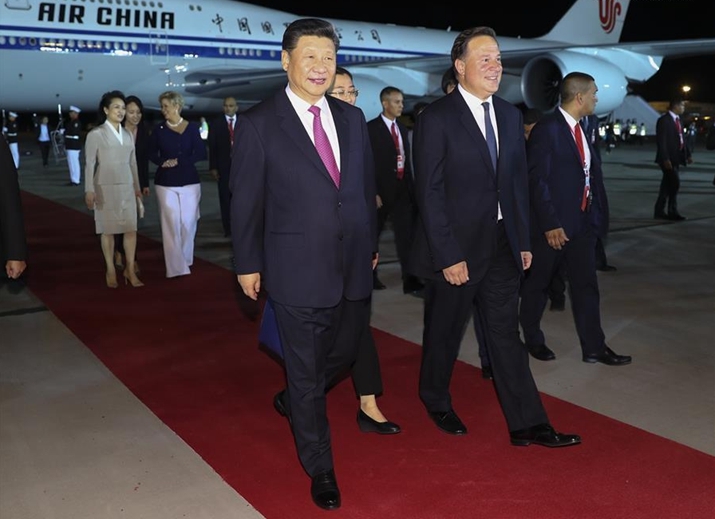 Upon their arrival at the airport, Xi and his wife Peng Liyuan were warmly received by Panamanian President Juan Carlos Varela and his wife Lorena Castillo Garcia with a grand welcoming ceremony. Accompanied by Varela, Xi reviewed the guard of honor. To greet the honored Chinese guests, a group of local people performed dances with distinctive ethnic features. Children waved flowers and national flags of the two countries. Xi said this is his first visit to Panama, and also the very first time a president of the People's Republic of China to visit the country in history. On behalf of the Chinese people, he expressed sincere greetings and good wishes to the Panamanian people. He said with the establishment of diplomatic relations one and a half years ago on the basis of the one-China principle, the two countries' interactions lasting more than 160 years have "turned over a new chapter." China-Panama relations have started strong with fruitful results in cooperation in various fields, he noted. Facts have proven that forging diplomatic relations fits the fundamental and long-term interests of the two peoples, he said, adding that there is great potential for future cooperation. He voiced the expectation that his upcoming talks with Varela will draw blueprint for the development of bilateral relations in the long run, boost mutually beneficial cooperation, promote common development, and benefit the two countries and their people. Xi arrived in Panama City after wrapping up a trip to Argentina, where he attended the 13th Group of 20 (G20) summit and paid a state visit. Xi's four-nation trip has also brought him to Spain. He will visit Portugal after Panama.